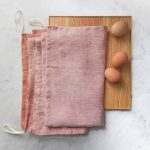 Reusable shopping bags are so much better than paper or plastic: They’re more ergonomic, better for the environment, neater to store, and they’re way cuter! 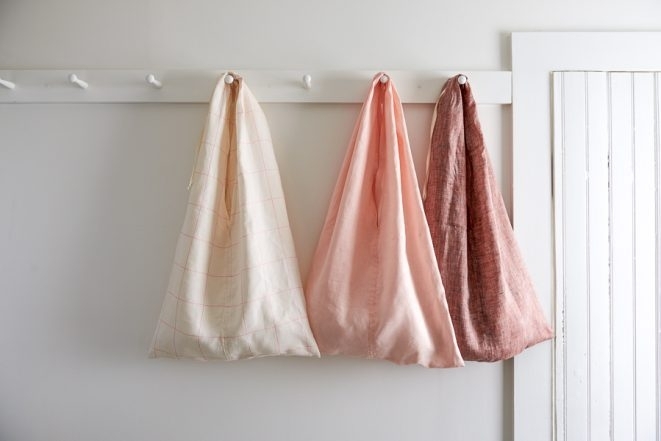 Our Fold-Up Market Tote checks off all these boxes, plus they are super fun to sew. 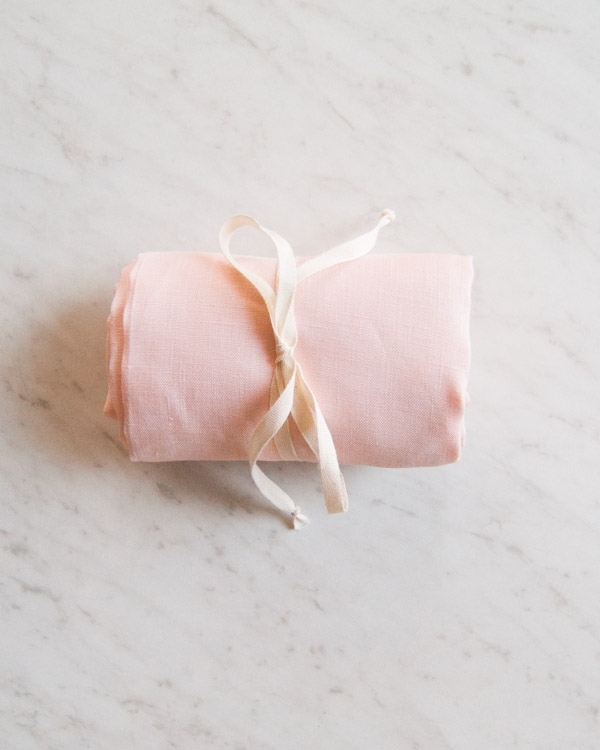 They are cleverly put together with only two pieces of fabric, four totally self-encased seams, and a nice cotton ribbon to tie the whole thing up. Machine wash and dry all the fabrics, but not the ribbon, before beginning. 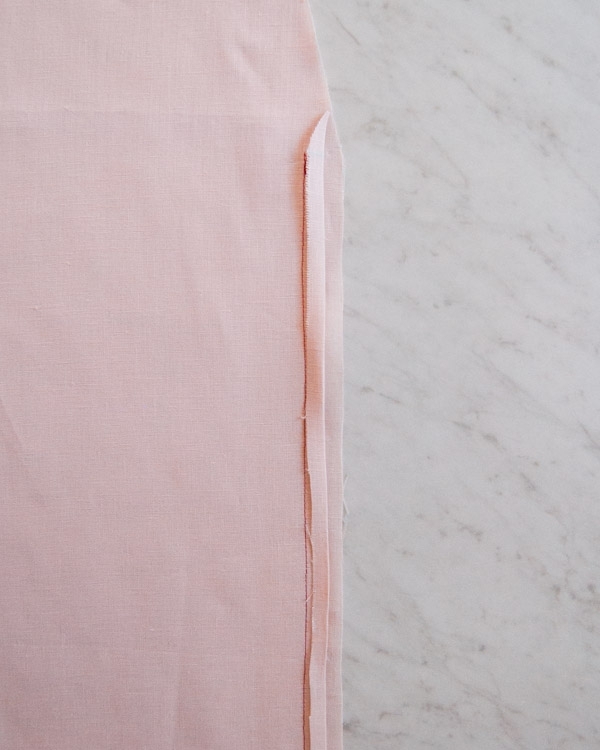 The fabrics we used do not have a clear right or wrong side, so just assign the sides before beginning. 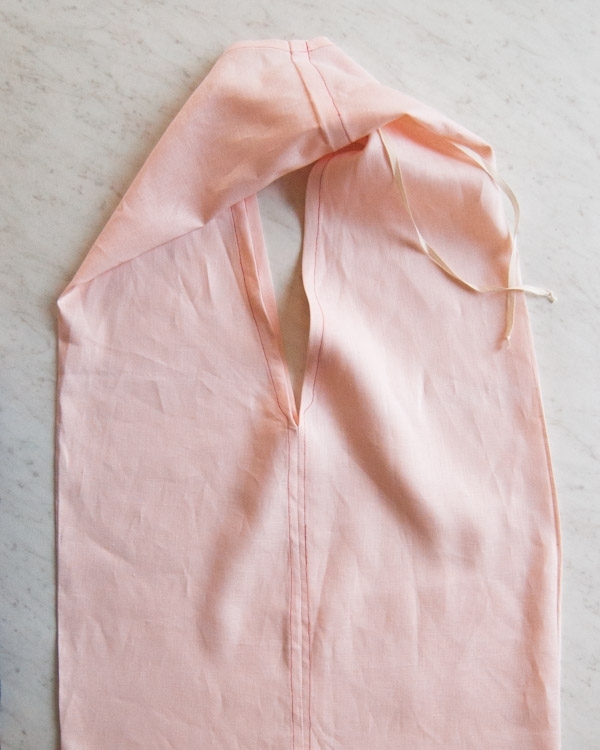 Fold this length in half and tie each end with a simple overhand knot. This is the Tie. Put it aside for now. Two 20 x 33-inch rectangles. Fold and press one of the rectangles in half lengthwise, wrong sides together, so that the two long sides meet. This pressed fold is called the Long Fold. Orient the piece so that the Long Fold is on the left and the two raw sides are on the right. Make a small mark at the top raw edge 6 inches to the right of the Fold. This is Mark 1. Then make a second mark (Mark 2) on the right raw edge, 17 inches below the top right corner. Cut a diagonal line from Mark 1 to Mark 2, cutting off the top right corner in a long triangle shape, as shown above. Repeat this for the second rectangle. 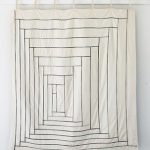 Unfold the fabric pieces and orient them so that each one’s Long Fold is running vertically and raw diagonal sides are at the left and right. With right sides together, pin the two pieces together along the straight right-hand side that runs below Mark 2. 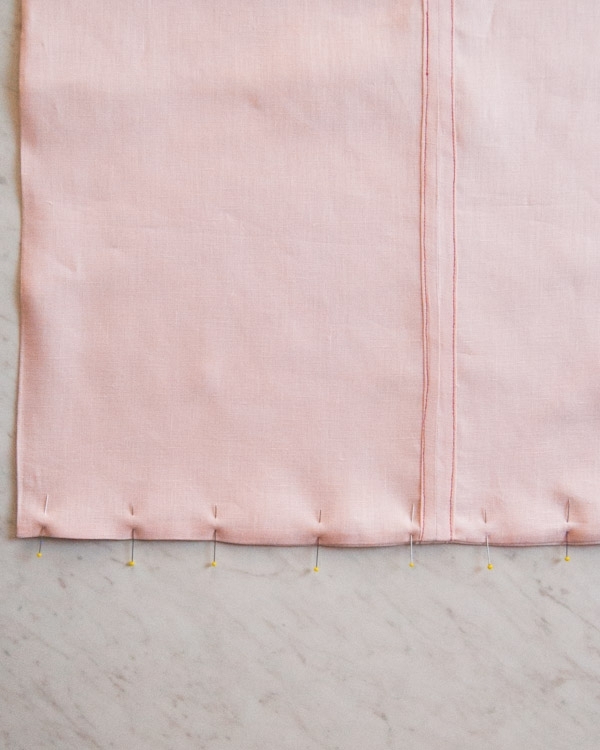 Starting at Mark 2, sew these pinned sides together with a 3/4-inch seam allowance. Backstitch at the beginning and end of this seam. 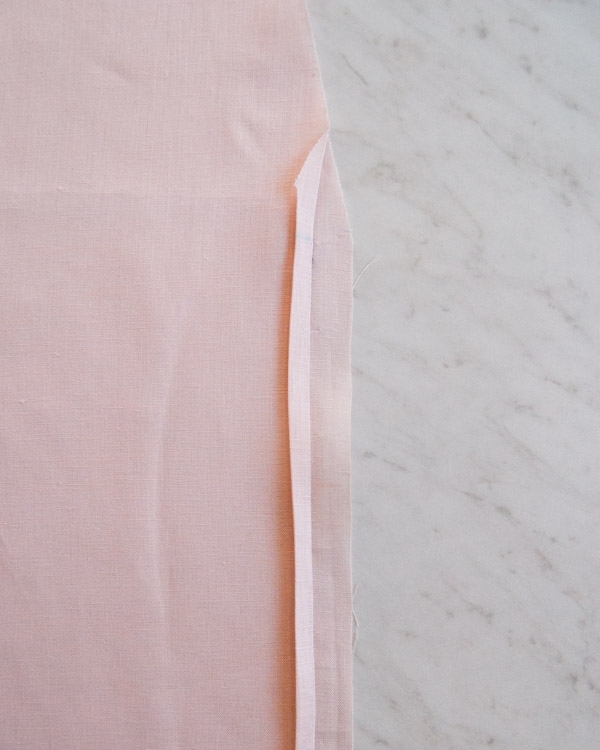 Press the top raw edge of the seam allowance 3/8-inch towards the wrong side of the fabric, so that the raw edge meets up with the seam. 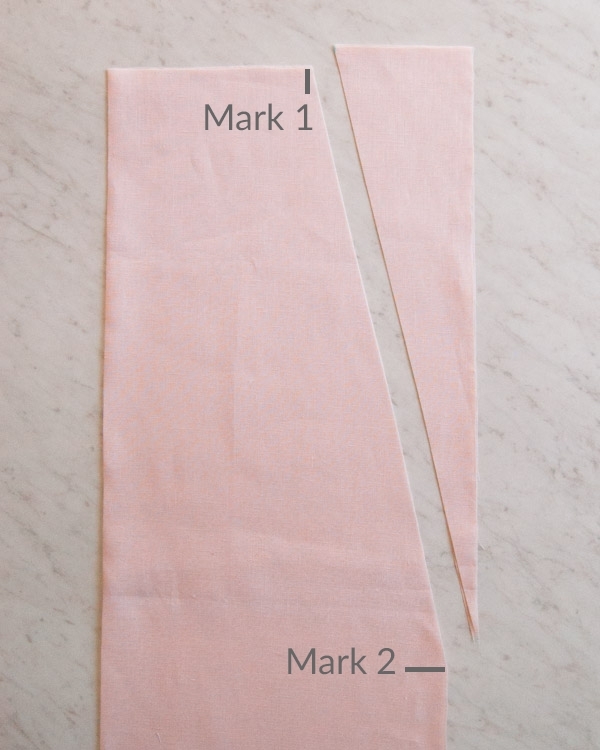 Press this side of the seam allowance over once more, towards the wrong side and along the seam, thus hiding the raw edge of the seam allowance. 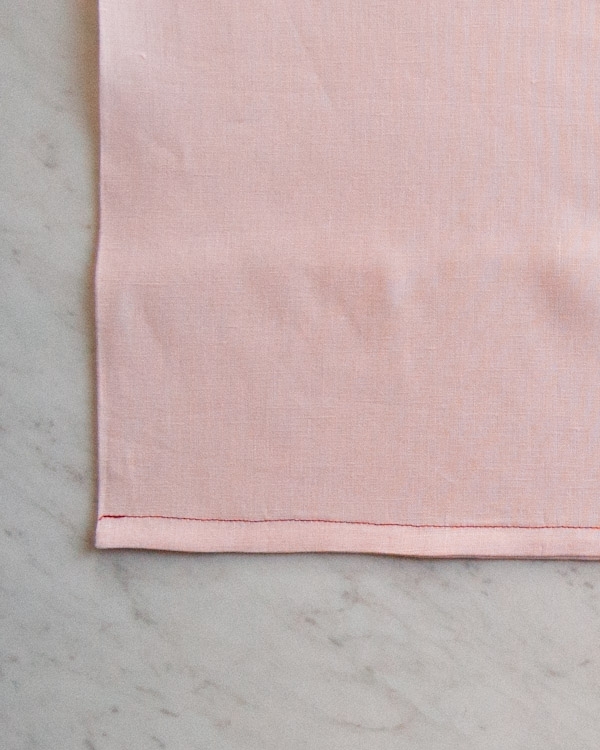 Next, fold and press the raw diagonal edge that is above the straight folded edge ¼ inch towards the wrong side. Then, fold and press the diagonal edge ½ inch over, thus hiding its raw edge. Pin both of these folded sides down. Only pin through the top fabric layer, not through to the second fabric piece underneath. Edgestitch these folded edges down, following along the angles of the fold. 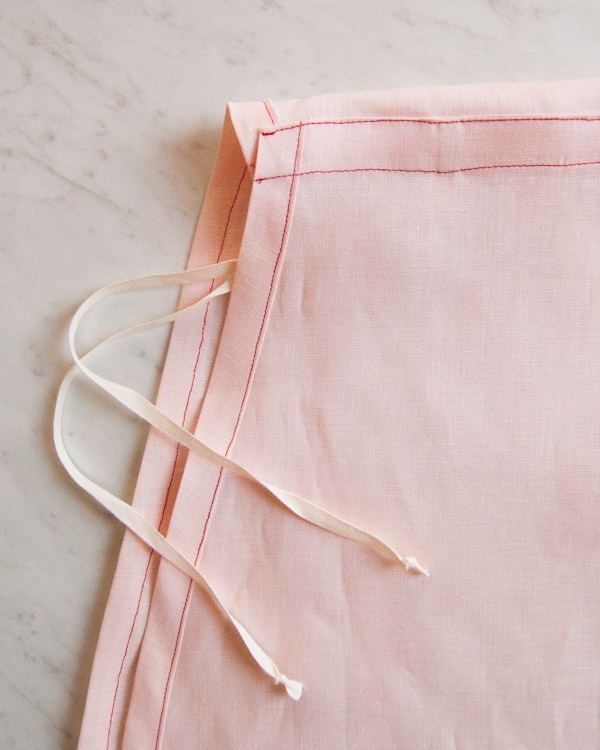 You will have to open up the bag along the seam so that you are only sewing into one side of the bag. 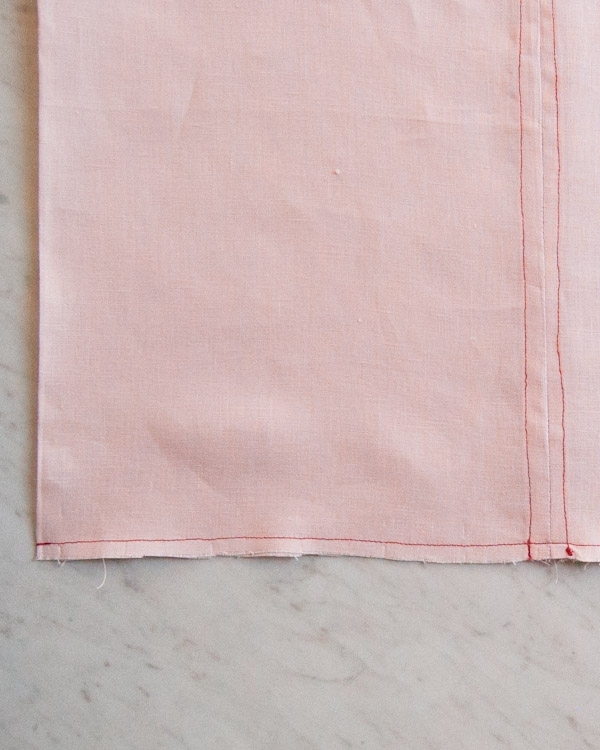 Flip the bag over and repeat this process for the remaining seam allowance and raw diagonal edge. The resulting seam is called the Center Seam. Repeat all of these steps for the left-hand raw sides. Turn the piece so that the right sides are facing out. Repress the Long Folds and line up both Center Seams so they are on top of each other. Pin the bottom raw edges together, being careful to keep the Center Seams directly on top of one another. 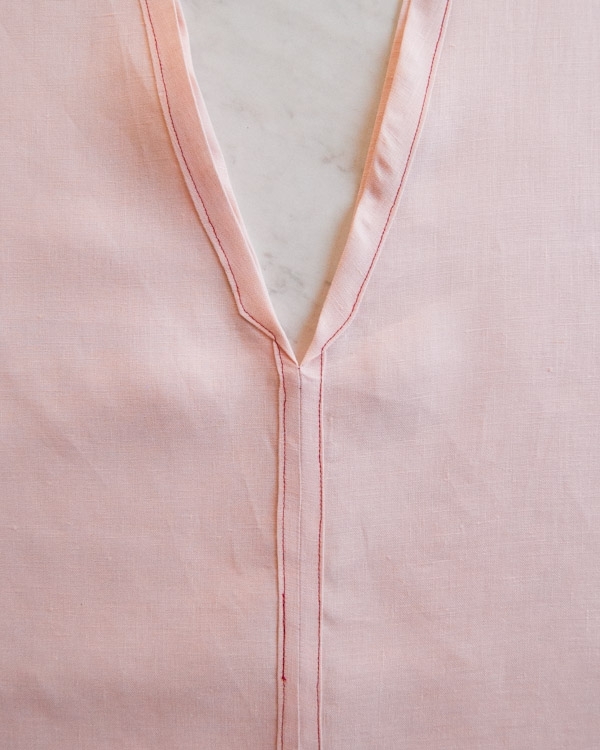 Sew this pinned edge together with a ¼-inch seam allowance. Turn the piece wrong sides out. 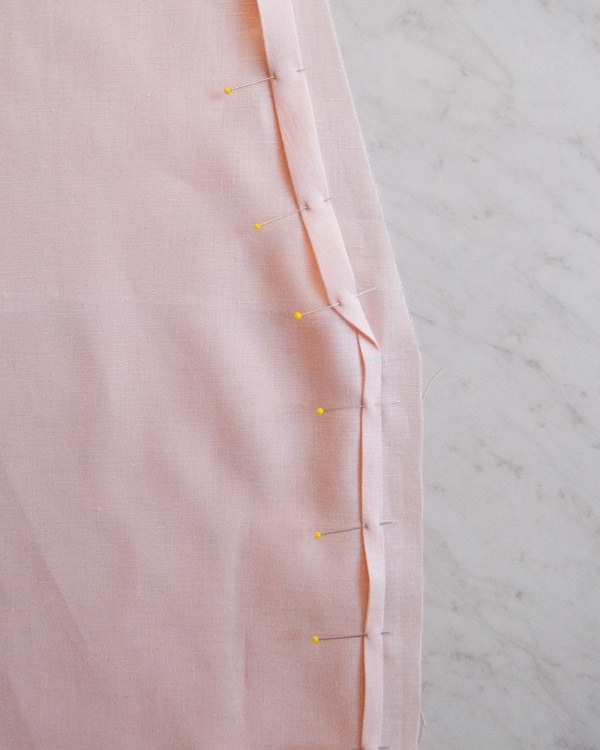 Press the bottom seam flat and then pin it once again. 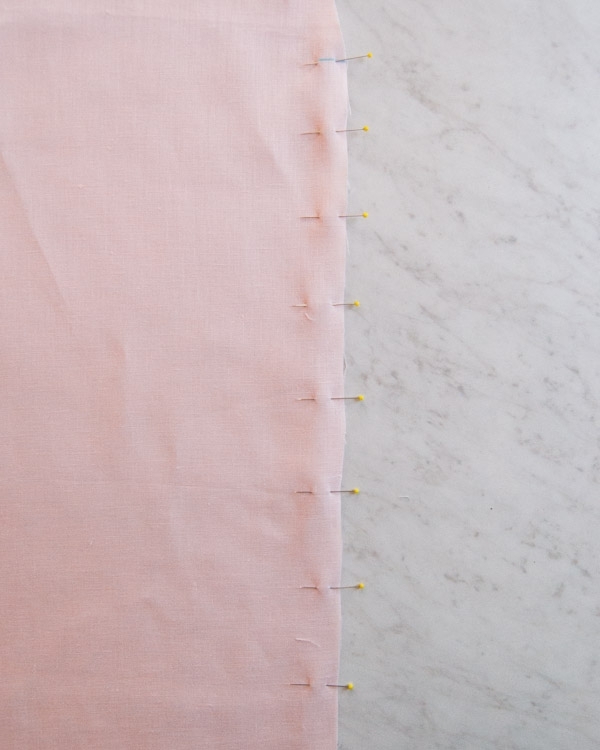 Sew along this pinned edge with a ½-inch seam allowance. 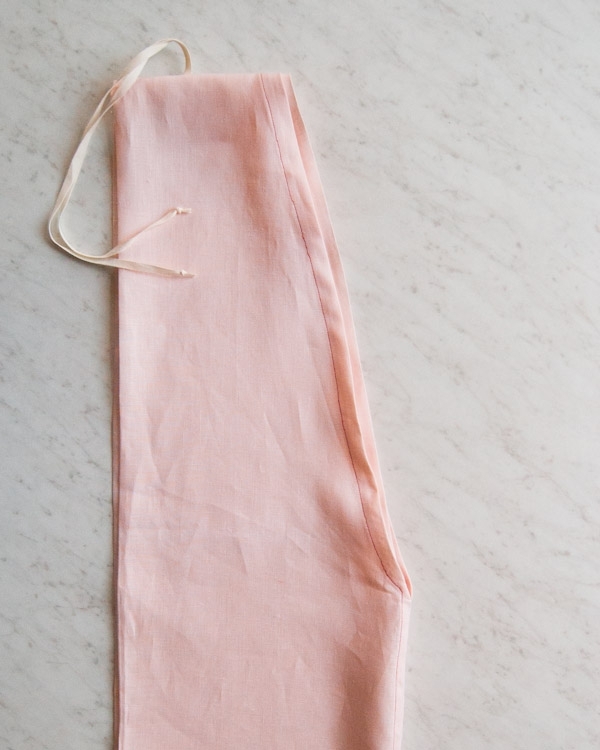 You have just sewn a French Seam, which encases the seam’s raw edges. Turn the bag right sides out again. 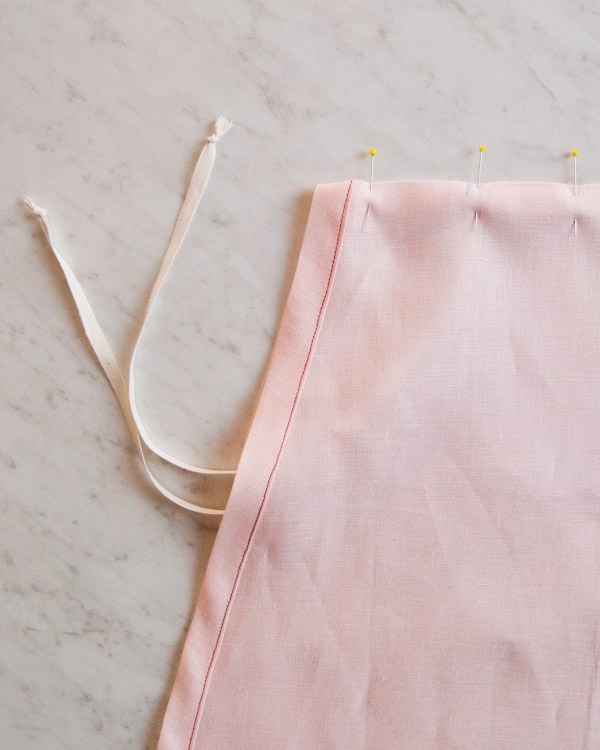 You will now sew a French Seam at the top of the handle. Pin together the top raw edges (the only raw edges remaining on the bag), wrong sides together. 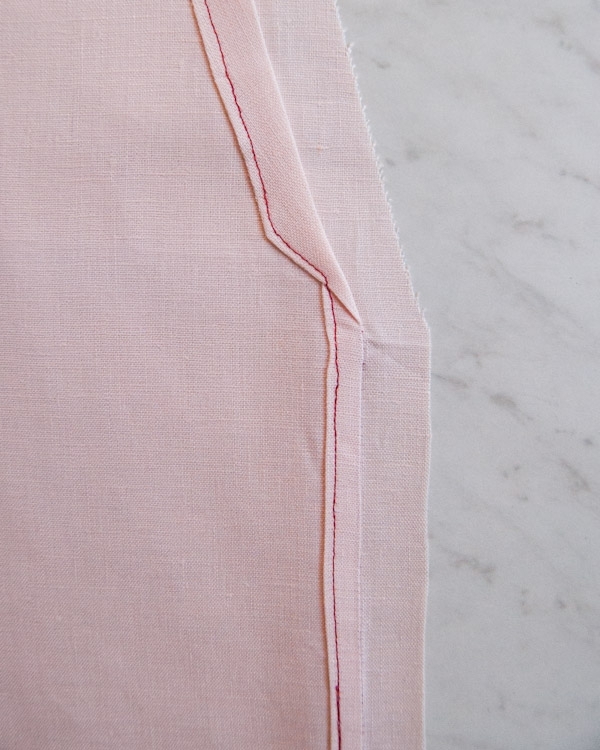 Sew this pinned edge with a ½-inch seam allowance. 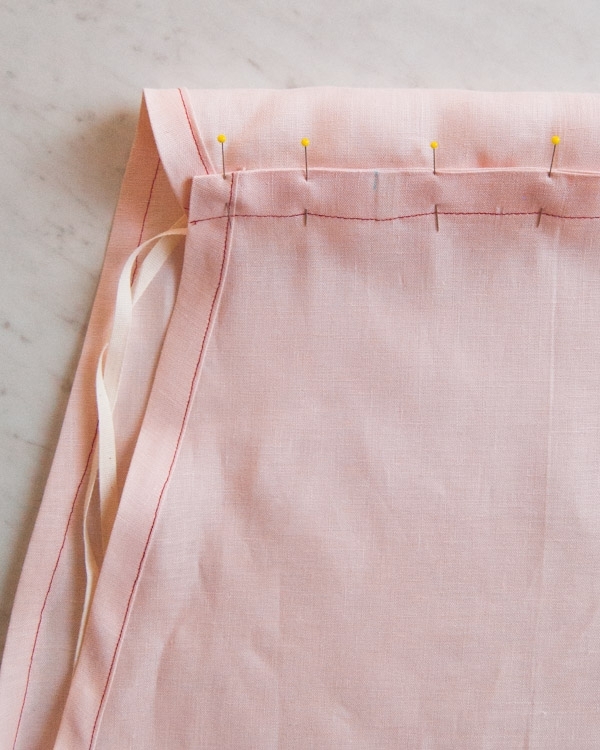 Turn the bag wrong sides out again and press the handle seam flat. 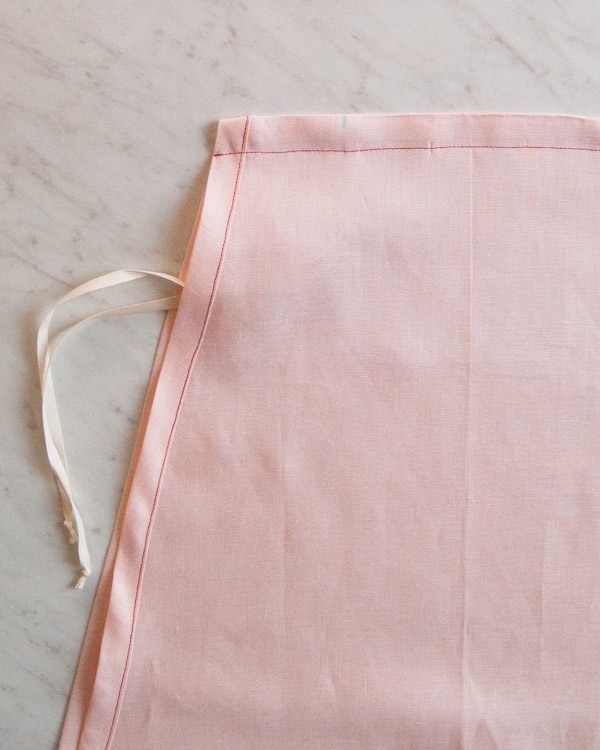 Make a mark along the handle’s top edge, 2 ½ inches from its left side. 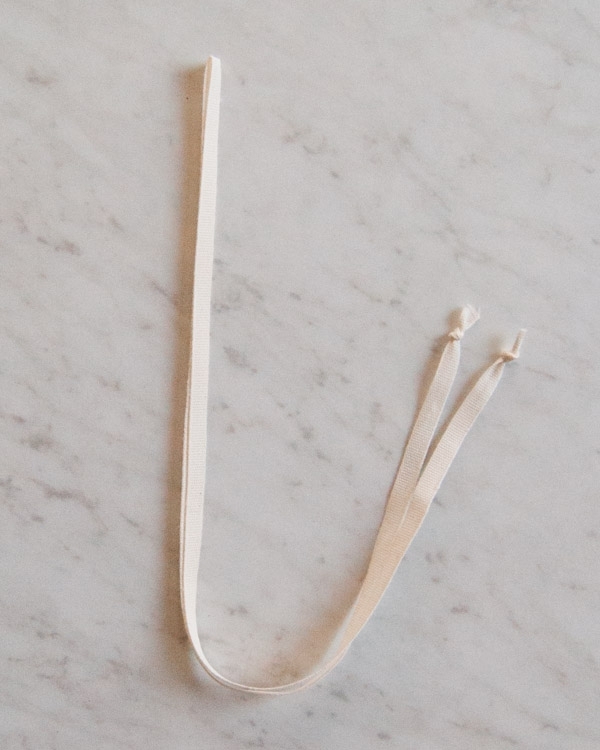 Slip the Tie in between the two layers of the handle and place the Tie’s folded edge under the mark. Pin the handle’s top edge together, pinning the Tie in place as you do. 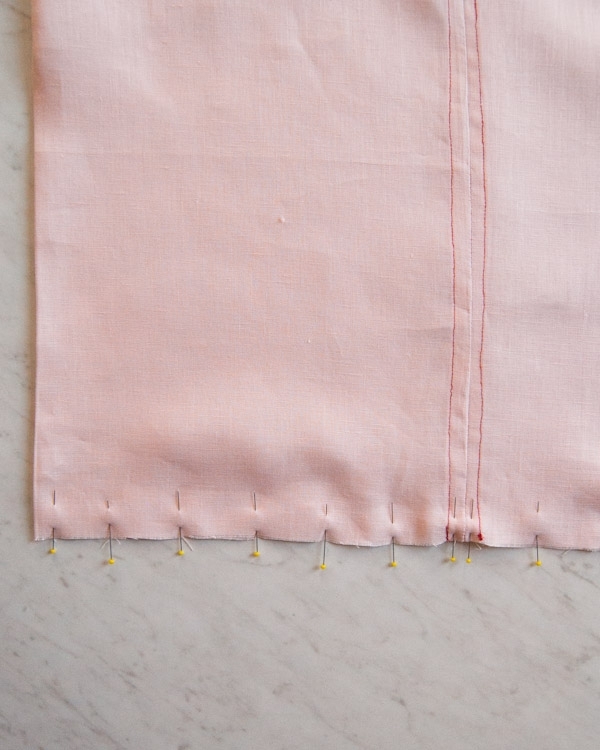 Sew this edge with a 1-inch seam allowance, thus sewing the Tie into place. 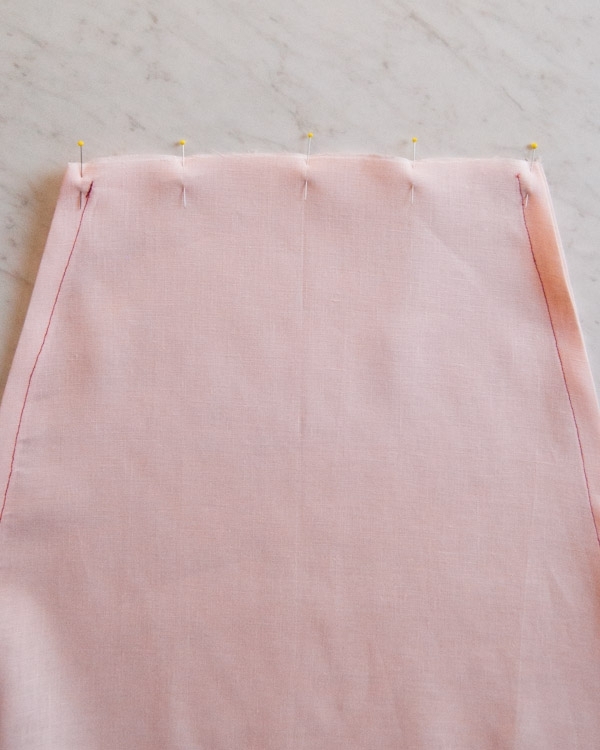 Press and pin this 1-inch seam allowance flat to one side. 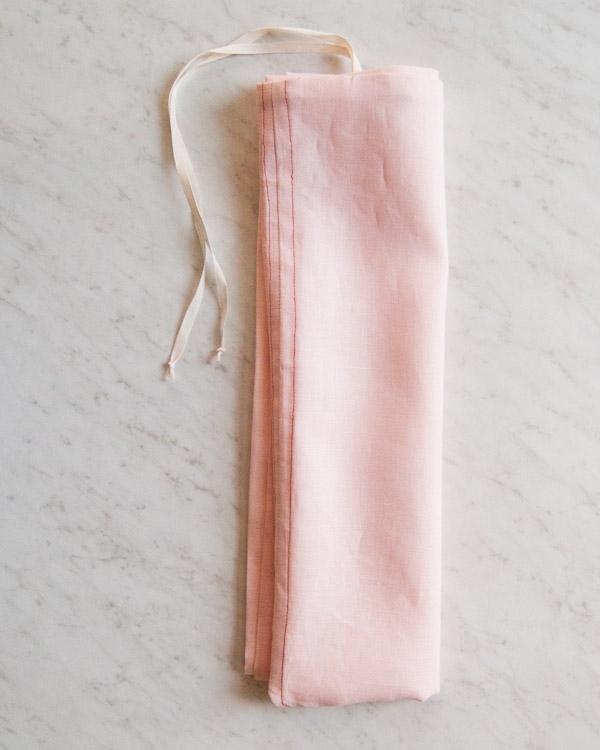 First, fold the bag in half lengthwise along the Center Seams so that the Long Folds meet one another. Then fold so that the top edge of the handle meets the bottom edge of the Tote. Then fold in half lengthwise so that the Center Seams meet the Long Folds. And use the Tie to secure the whole thing with a bow! It’s adorable, but won’t hold much more than a can of tuna. This bag is actually quite roomy and can fit a bunch of groceries! It’s 18 3/4 X 15 -inches which is wider and taller than a standard plastic shopping bag and the thick handle makes it much easier to carry. If you have any questions please let us know! 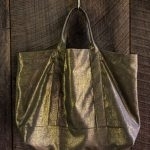 You have just posted the most perfect bag ever! 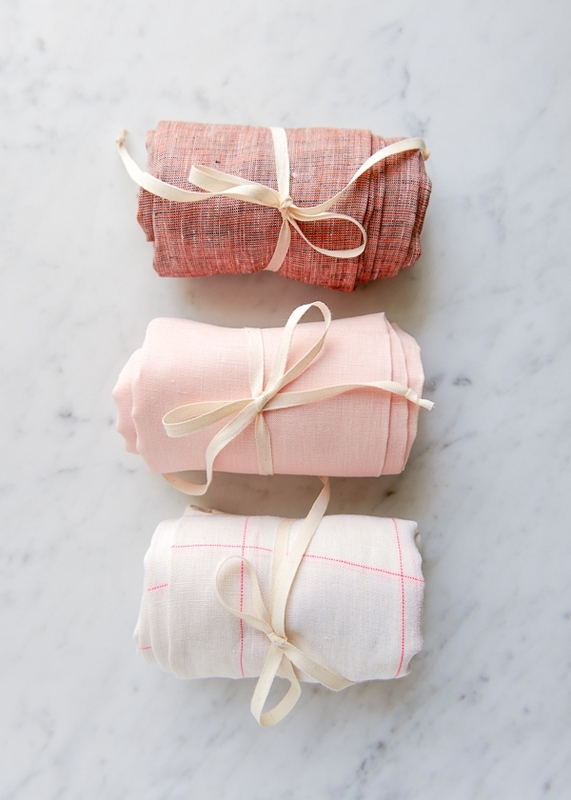 I’m going to make these to replace gift wrap and one for me!! Thank you, thank you!! I was looking at your color choices and fell in love with the grey kit. But I fell in love with it thinking it was lavender… Does it have a purple hint to it? Or is it a true grey? Thanks! 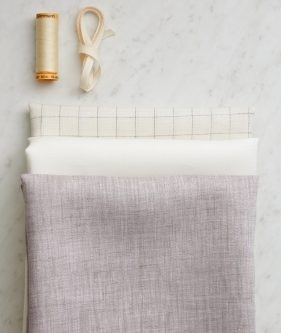 The Gray bundle has three fabrics, one white, one white with a gray grid, and one lavender/ gray semi solid Watercolor linen. 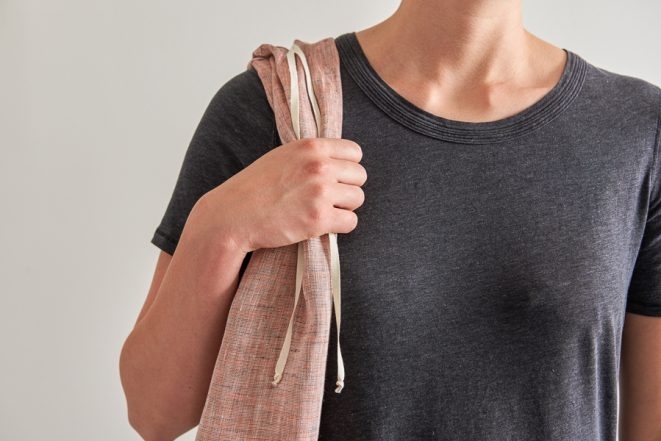 The color is called Lilac Bark and you can see it on the bolt here: https://www.purlsoho.com/purl-soho-goods/purl-soho-fabric/watercolor-linen.html It is definitely a light purple shade, not a true gray. If you have any more questions please let me know! Why do I need three yards of ribbon? Only 30″ are used for the tie, or is it assumed I am making three bags? Probably even more! 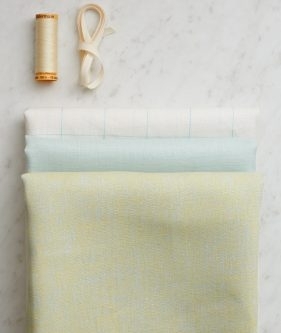 The materials listed here are what is contained in our pre-cut bundles which is indeed enough for three bags (one in each fabric.) 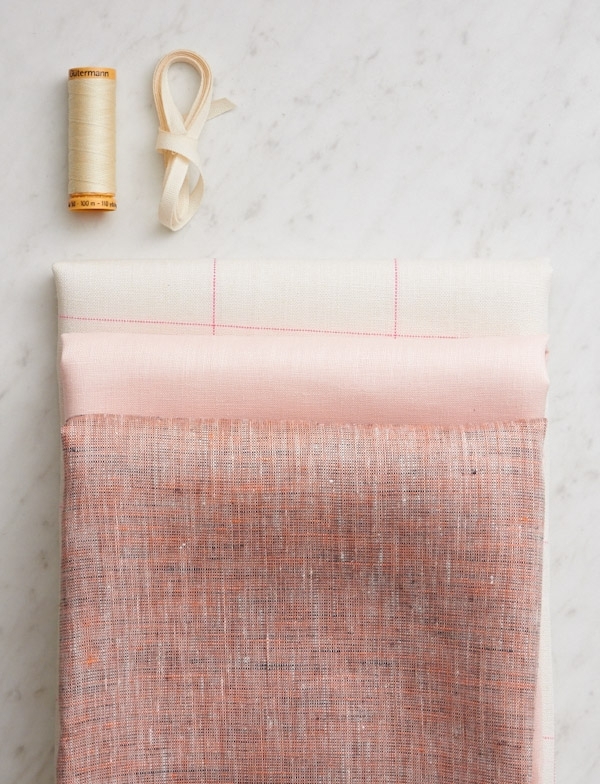 If you are using your own fabric you will just need 30″ of ribbon. I can see making quite a few of these for the holidays and for myself. Thanks for the pattern!! What a wonderful way to encase a precious gift for a friend. A ‘two in one’ gift! Thank you so much for the easy pattern. 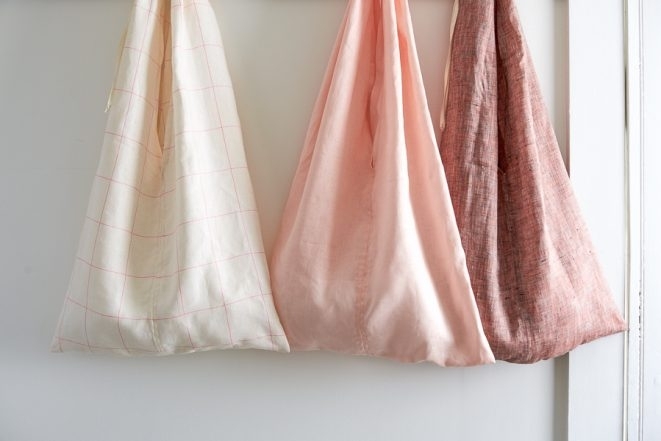 Market bags are always, always needed. you mention 1 yard of fabric per bag. Is this from a yard that measures 45″ in width? 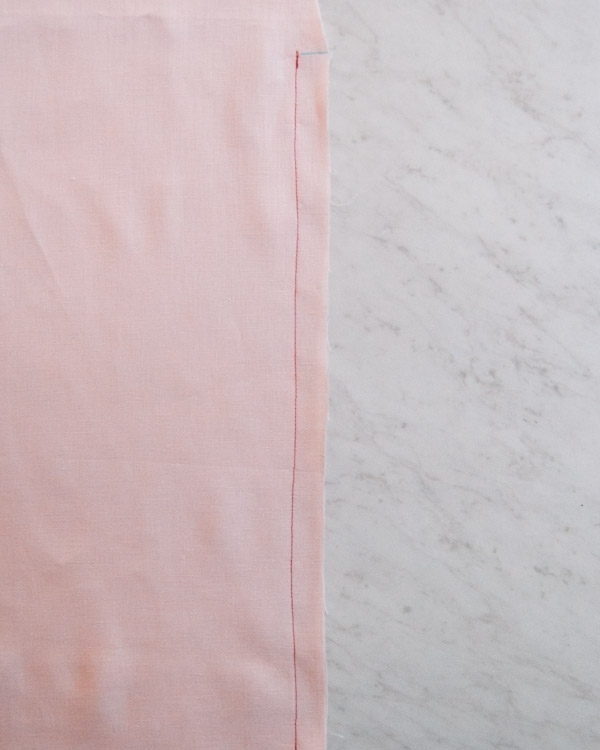 The fabric we used is actually 60-inches wide but this would work fine with 45″ wide fabric as well. You need to cut two rectangles 20″ X 33″. A very nice pattern to give as a gift. I’d like the handle at top to be narrower. Do I just move Mark 1? Any other adjustments? You’ve got it… just move Mark 1 closer to the fold. Please let us know if you have any more questions! I wanted a thinner handle, but I still wanted it to feel nice and sturdy, so I folded in the edges of the handle to meet in the middle and tacked it down with two rows of stitches. It is just as strong as before, but now is half as wide at the shoulder. I didn’t use the tie–you would probably have to adjust its location if you change the handle. What a great modification! Thanks for sharing! My daughter and I made these totes for holiday gifts and I posted about our experience on my Appleton Dance weblog. 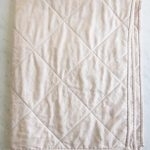 Has anyone tried using another fabric other than linen? Just looking at pricing and wondering if there is a more cost effective fabric that could be used. Thanks! Thanks for the lovely pattern. I have also made a few of your Easy Easier Easiest totes, they’d are brilliant. 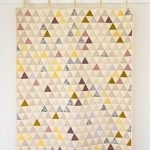 Has anyone tried making this pattern with a more durable fabric, i.e. oilcloth or, dare I say, Kraft-Tex Paper Fabric? Thanks for writing in and what a great suggestion! I have not seen one personally but think that a thicker fabric would work very well here. 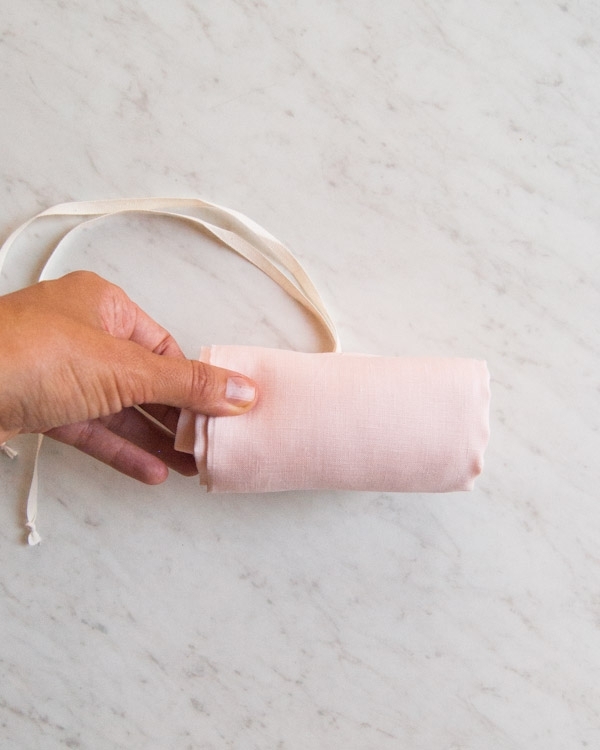 Just be sure that you are able to roll up the fabric easily for ease of transport and you should be good to go! I love this DIY, because it is perfect for a present. Thank you for this pattern and directions. Do you by chance have a video tutorial of this? I am a little confused on a few of the steps. Please let me know, thanks! Thanks for writing in! We do not have a video to accompany this project. I would be happy to try to help answer any questions that you may have! Lovely, even someone like me who can barely sew can do this! Thank you for the lovely pattern Ali, I have just made a wedding shawl for my daughter. 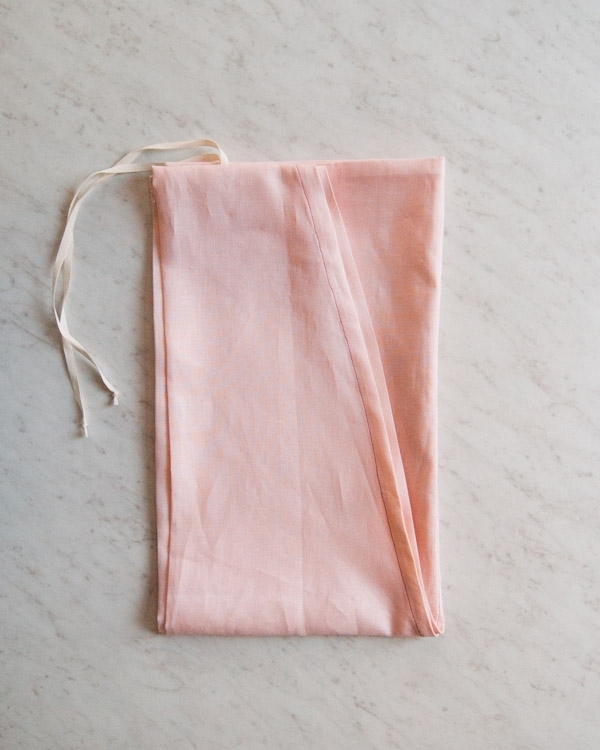 I wanted to put the shawl into something special, your bag is just that, simple and beautiful. Thank you. I had to make this pattern so simple easy and ekegant. There was a bit too much fabric in the shoulder for me so I cut the initial angle at 6 inches fronm the corner not fiom the fold. Also folded the strap in 3 at the shoulder and tacked it down. I boxed out the bottom corners 2.5 in as I don’t like a flat bag. 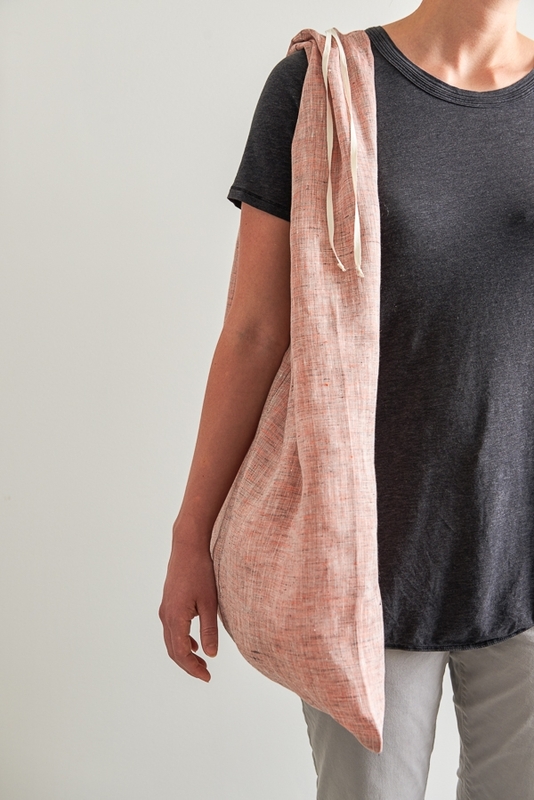 This bag sits very nicely on my shoulder and I will be making more. Thank you for the pattern. Thank you so much for sharing your modifications and for the kind words! We’re sure that lots of other readers will thank you, too! 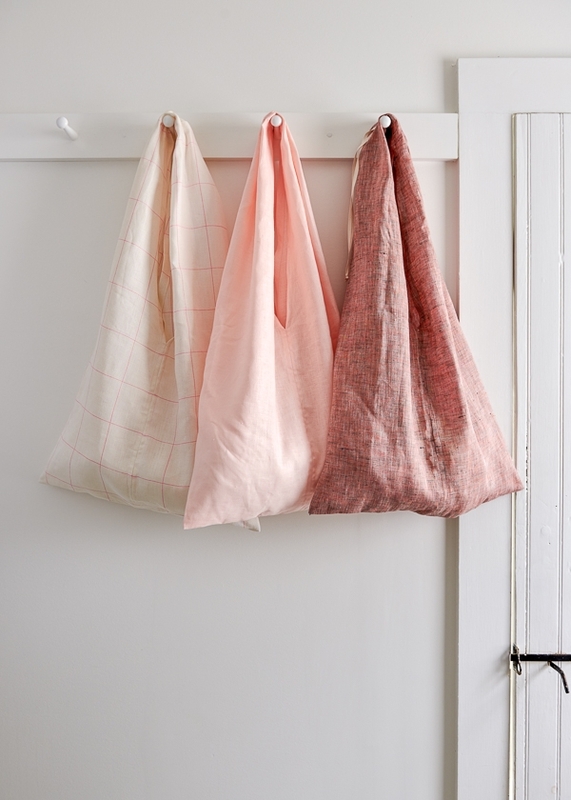 I was wondering if I have to use linen to make these bags. What would I do if I wanted to make them smaller? Thanks for writing in! Linen is quite a strong fiber even at lighter weights, so if you would prefer a cotton fabric and plan on carrying anything heavy in the bag, I would suggest using something in a heavier bottom weight such as a denim or light canvas, though this will result in a bag that will not pack down quite as small as ours. The size of the bag should be quite easy to adjust! 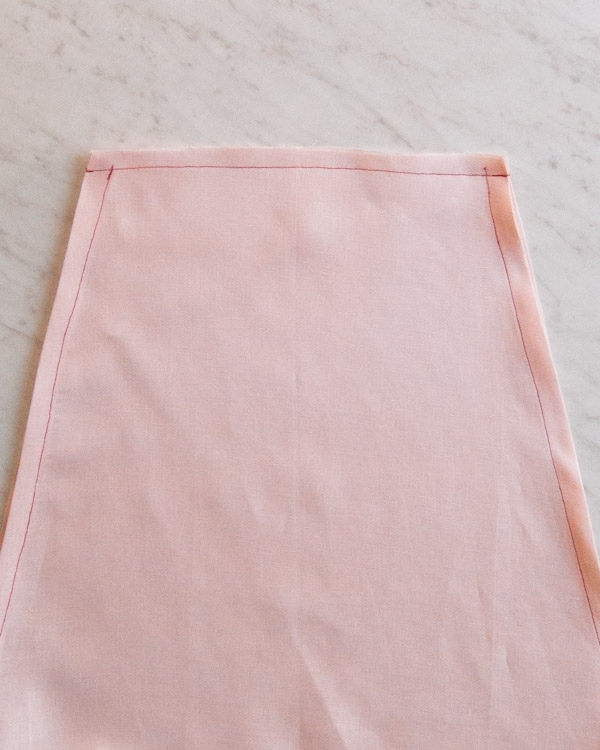 When cutting your rectangles, you can make any changes you like to the height and width, and then adjust the placement of your diagonal cut to make sure the top of the handles isn’t too narrow and the bottom of the bag is deep enough. Cutting the rectangles: the first Mark is 6″ to right of the fold. Mark 2 is 17″ below mark 1. How many inches is mark 2 away from the fold? Thanks for reaching out! Mark 2 is all the way on the raw edge. 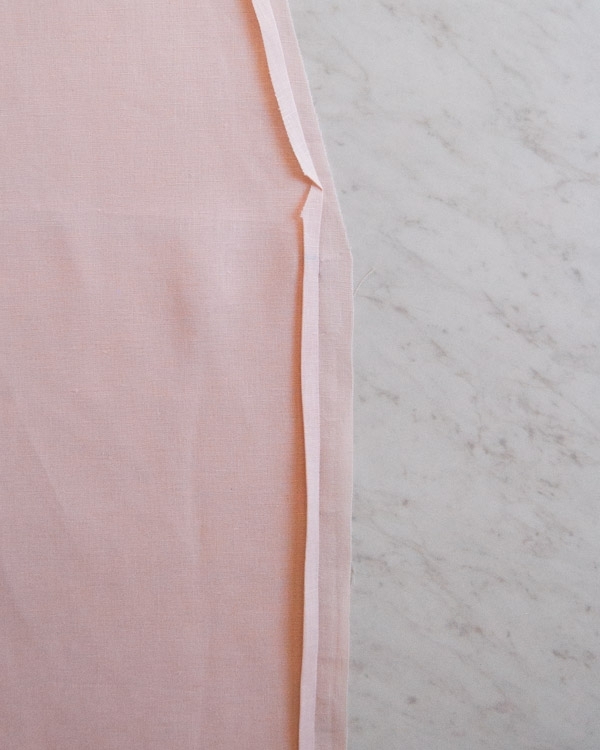 So for the piece of fabric that you have folded, the edge should be 10 inches from the fold! 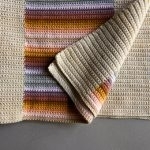 Love your soft color choices! And the sweet, elegant designs. 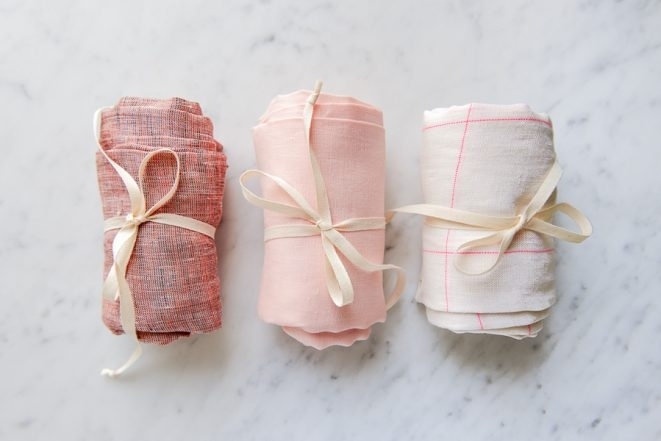 I am somewhat addicted to linen. I can’t wait to try this!! How elegant and absolutely useful!